Marriages over 75 years old are on the GRONI site. So you can view David Mateer’s marriage to Mary Armstrong. It was in Belfast on 21.3.1942.
had 6 kids: David (my dad), Issac, Frank, Edward, Vivienne and Sally. 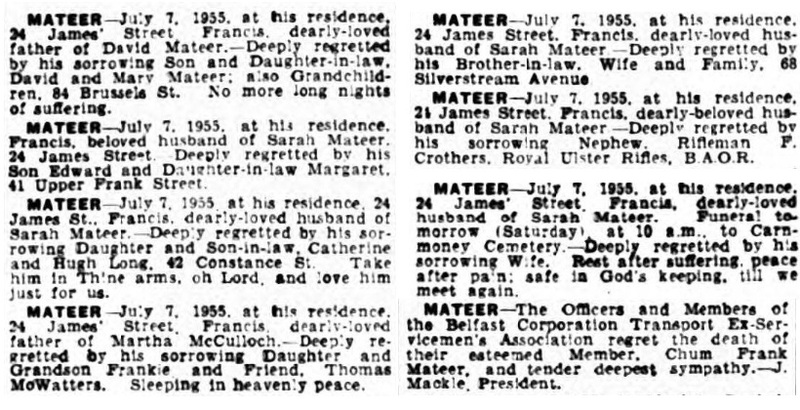 What surprised me is that the name combination of Francis Mateer, even allowing for variants, is quite rare (according to the 1901 and 1911 censuses). 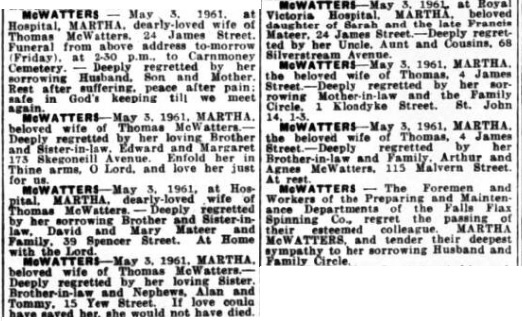 If the stated name of David's father in the 1942 marriage record should turn out to be Francis Mateer, that rarity, allied to the Dodds angle I've covered above, would be a strong indication that the parents of David Dodds Mateer were Francis Mateer and Sarah Crothers. In the absence of finding online a c.1923 birth/baptism record for David, viewing the 1942 marriage record may help. A six year old girl was knocked down by a coal lorry in Cambridge Street, Belfast, today. She is Vivien Mateer of Spencer Street, Belfast. She was removed to the Royal Victoria Hospital with a foot injury, but was later released. Wouldnt by anychance have the links to newspaper articles that have been found? I have found that my grandmothers father is David John Armstrong from marriage certificate. I'll post the articles here a.s.a.p. Did the 1942 marriage certificate confirm David Mateer's father's name as Francis? (I'll be amazed if not.) Was there any other information recorded that would help us, eg. what were the addresses and occupations, was Mary's age stated, what were the witness names? Mary Armstrong - father: david john armstrong - labourer. if ive read certificate correctly it also says that is deceased. address 31 [censored]**mount street Belfast. again cant make out what it says lol. thank you for your help, its greatly appreciated! !